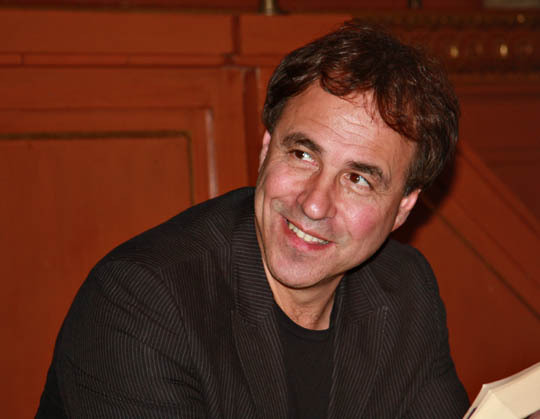 Anthony Horowitz was in conversation with Paul Blezard (writer, broadcaster and presenter with 'Oneword Radio') at the Sheldonian Theatre. A large crowd of wide-eyed children awaited Anthony at the Sheldonian Theatre on 25th March. As well as being an acclaimed TV writer of series like 'Foyles War' and, of course, Midsomer Murders, he has won the hearts of millions of youngsters with his Alex Rider stories and other childrens novels. The bookstall in the hall was immediately swamped with children eager to get their hands on the latest 'read', in fact some couldn't wait to explore the new stories, settling down straight away to read the next adventure. This is surely encouraging in this modern world of PCs, computer games and other electronic gadgets enticing so many children away from the delight of reading. Antony said he knew he was going to be a writer from the age of 8 as he just wasn't good at anything else. Also, that James Bond had an enormous influence on him. He decided he wanted to write about a teenage 'James Bond' and Alex Rider was born. His TV writing career began with Robin Hood and has continued to grow. 'Foyles War' will be coming back to our screens in April. Midsomer fans also have Tom Barnaby's (John Nettles) last case to look forward to, which has been penned by Anthony. However, we will have a much longer wait before this episode is seen. At the end of the interview Anthony answered lots of the questions from the excited audience, finishing the evening by patiently working his way through the huge queue of children awaiting autographs. 'Crocodile Tears' is Anthony's current best seller and the 8th in the Alex Rider series. Later this year, a tome entitled 'More Bloody Horowitz' will be published, described as "giving horror a whole new look - a mischievous collection of macabre tales". Great news for fans, Anthony will be writing one more episode of Midsomer Murders!! With John Nettles retiring at the end of Seres 13, this has now been confirmed that this will be Barnaby's very last case. Anthony has been busy promoting his latest book 'Necropolis', the 4th in his exciting 'Power of Five' series. a couple more episodes of 'Foyles War'. 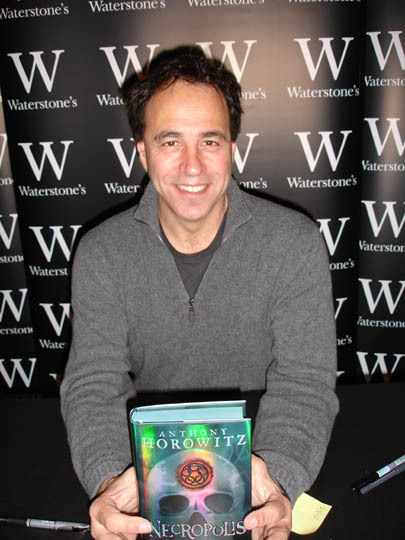 Anthony Horowitz was born in North London in 1955. He attended a boarding school in Harrow, then went on to York University. Deciding on a writing career at the tender age of 8 he then went on to have his first book published 'Enter Frederick K. Bower' when he was 23. Married to TV producer Jill Green, they have two sons. Anthony created the TV dectective series 'Murder in Mind' and 'Foyle's War' as well as writing episodes for 'Midsomer Murders', 'Poirot', 'Murder Most Horrid', 'Boon', 'Menace' and 'Robin of Sherwood'. He has also written for other television programmes and achieved phenomenal success with his 'Alex Rider' children's books. He was awarded 'The Red House Children's Book Award' in 2003. Anthony commented that he found adapting the Caroline Graham 'Inspector Barnaby' novels for TV very challenging. However, his screenplays captured the essence of the novels and are among the most popular episodes of the series. His original screenplay for 'Judgement Day' has proved to be a particular favourite.